1. C.C.S Pension : The Commissioner assured with confidence to the delegation present that he has already taken much pains in the drafting of cabinet note in NVS employees favour and forwarded to the concerned authorities and ministry for due consideration. 2. 10% Special allowance: His Highness commented that the proposal is in the advanced stage and it has already been forwarded to the concerned ministry for reconsideration. 3. M.A.C.P to the teaching staff : The Commissioner reflected that the Sixth Pay Commission implied MACP to be given to the non teaching staff only. Howsoever, AINVSA has thought of sending representations once again as the teaching staff of Delhi state Govt were receiving the same. 4. 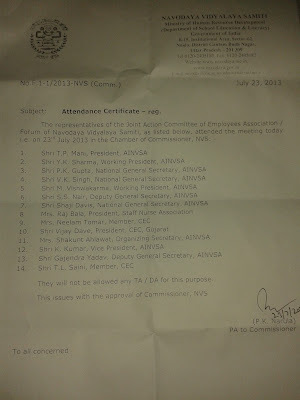 Transfer Policy: The Commissioner directed the delegation to give in writing all their suggestions in this connection which would be taken up with the executive committee of NVS expeditiously. ( Enclosed herewith separately is the Suggestions regarding amendments to be made in Transfer Policy submitted to the Hon’ble Commissioner.) Howsoever after much persuasion his Highness assured that he would try his level best to reduce the normal tenure to 06 years. He added that the transfer points would be displayed on the website for all the transfers of the staff in future, when beseeched upon by the delegation. 5.Recognition of AINVSA: The Honble Commissioner was convinced that Shri T.P.Mani’s Association is the real and authentic Association. He directed the delegation to take up the task of recollecting the Membership forms once again, at the earliest for verification and granting Recognition to AINVSA. 6.Payment of Salary for Strike Period: The Honble Commissioner assured that the Strike period would be regularized and not treated as dies non. Howsoever, those days salary would not be disbursed meanwhile to those gone on strike as a punitive measure. 7. Reduction of Service to the Post of Principal: The Honble Commissioner conceded that 08 years of qualifying service as PGTs for the post of Principal was much appropriate, instead of 12 years prescribed by NVS. 8.Appointment of Warden and Matron on permanent basis: The matter has gone to the Ministry for due consideration. 9. Seniority lists to be updated: The Commissioner reflected that Seniority list of PGTs would be updated regularly. 10. Stepping up of pay of seniors with that of their juniors: The Commissioner said that the Anomalies of TGTs were considered within the same Region and PGTs on all India level. And only those case forwarded by the Deputy Commissioners of the Regions are likely to be considered. 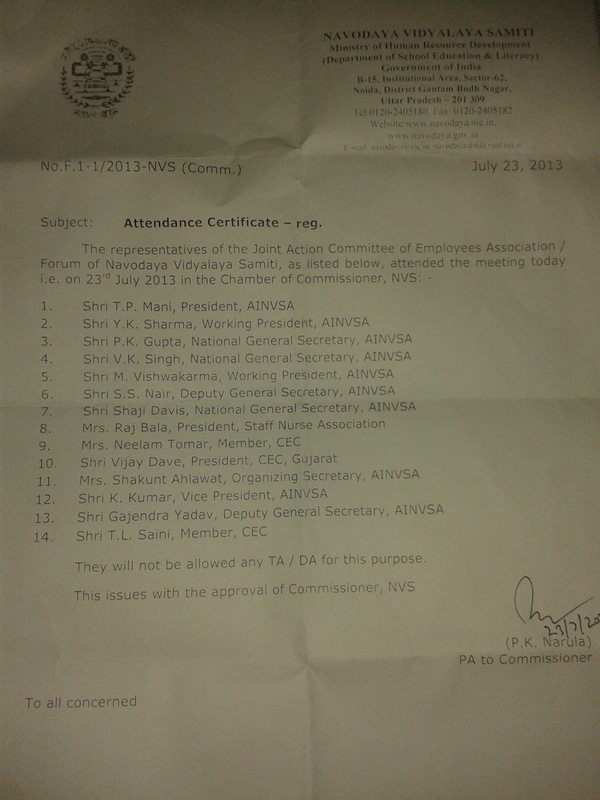 The Commissioner received the Charter of demands and gave a hope to the delegation that he has had always a soft corner for the welfare of NVS employees. The delegation offered their gratitude to the Honble Commisioner in return and departed with a contented heart . 12. Smt Raj Bala President Staff Nurse Association. 14. Shri T,L Saina Member CEC. 2) Hon’ble Addl. Secretary,Ms.VrindaSarup,Dept.of School Education & Literacy, Govt.Of India, ShastriBhavan, New Delhi-110001.